Now we are just out of the summer month, and it is time to have a look the tires which I tested, and to bring up the safety issue. Finally, we made a new function on Tourstart, which makes it much easier to plan a great motorcycle tour, and I will like to share this with you. During the summer I have tested the Bridgeston Battlax S20 tires. Living on the edge is now much safer, as the grip from the Battlax tires are fantastic. All you need is to warm them up a bit first, as cold tires do not stick that well - which is pretty natural. Just forgot this one evening as I started off a bit too quick and wanted to make a 90 degree turn with some throttle. Instantly, the tires told me in - a polite way - to relax a bit. After just a few kilometers of ride you are safe to explore the edges which is the home of the FunZone. Go for a turn with high turn-in speed and give it some throttle in the turn, and all you will experience is that the tires ask for more - this is the behavior which makes me smile all over my biker face. You will experience a much sharper turn-in with the tires and you are able to do a higher speed in the turns. The bike do not understeer nor oversteer - it goes exactly where you tell it. 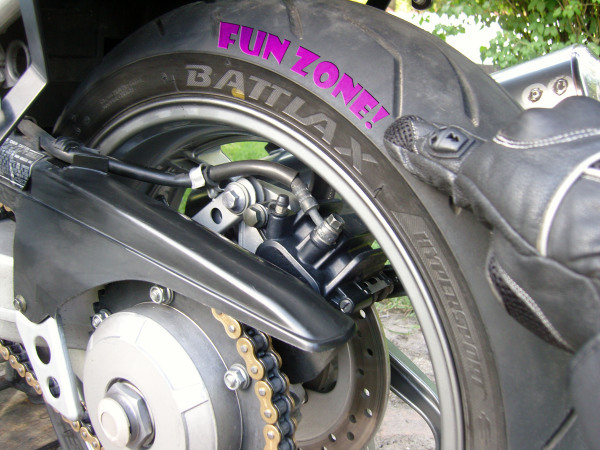 With the Battlax rubber your motorcycle is significantly easier to get in and out of the turn, as you will feel the tires help you get in the turns and guide you fast, fun and safely through them. WIth the Battlax S20's you will have a piece of the racetrack mounted on your motorcycle, but do not worry about the wear. There are plenty of kilometers in the tires. I have now done 4 500 km on my VFR750 and there are at least the same amount of km left. Even with the safe Battlax tires, there are still a few other things to consider regards safety. I am sure it hurts to hit the tarmac in that outfit. It is a matter of risk vs comfort. First, we do not all have the same way to dress, but luckily this is not the standard. I got inspired to write about safety, as each summer I see some motorcyclists ride in gear giving too poor personal protection in case the accident occures. So with the risk of bein old, boring and outdated, I urge you to be safely protected when riding the motorcycle.